I've just played for the second time your production of DANDELION WINE and it's fabulous. I'm so very proud of it. In fact, it made me weep. In your own way you've told me that I have a chance of part of me living beyond the day that I leave this earth. This production is simply incredible. I can hardly wait to see what you do with SOMETHING WICKED THIS WAY COMES. I know it will be fantastic. Please thank everyone involved and let them know that they moved Ray Bradbury to believe in himself. "Cooger and Dark's Pandemonium Shadow Show" comes to Greentown, Illinois, one week before Halloween. 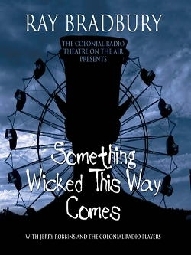 Two boys, Jim Nightshade and Will Halloway, soon discover the evil of this carnival, which promises to make your every wish and dream come true. But with those wishes and dreams comes a price that must be paid. Behind the mirrors and the mazes ... is the nightmare of a lifetime. 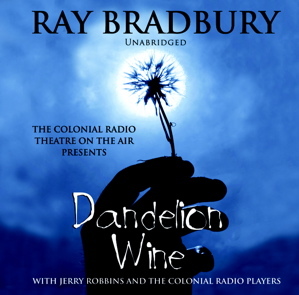 Featuring the evocative prose and imagery of Ray Bradbury, the fine acting of the Colonial Radio Theater players, and atmospheric music and sound effects, this story will send shivers of delight (and spine- chilling terror) through listeners young and old, long after the last candle has died in your jack-o'-lantern. "The Halloween Tree is an awkward piece to adapt. Bradbury's novel really has two narrators: as well as the authorial presence, Mr Moundshroud is a non-stop explainer of the fantastic events that happen to Tom Skelton and his friends. The novel is also highly episodic, as the gang find themselves transported from one historical tableau to another in their continuing quest to find and rescue their friend Pip. Robbins' dramatisation is, however, effortless. With none of the constraints of pre-defined stage play scenes to work from, he has created a pure radio dramatic experience: a free-wheeling adventure that can in an instant convince us that we are flying with a kite, building Notre Dame, or visiting the catacombs where Mexican mummies pass eternity. 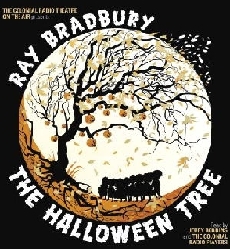 What makes this dramatisation of The Halloween Tree work is the extravagant musical score. In some previous Colonial productions, the underscoring has sometimes threatened to overwhelm. Perhaps because this production has a narrator (or two narrators), it is never prevented from summoning up fantastic imagery, imagery which comfortably rides on the elegance of Jeffrey Gage's music. I have only once concern about this production: I'm not at all sure how Colonial can top this." The people of Earth are preparing for war – a war that could potentially destroy the planet. Explorers are sent to Mars to find a new place for humans to colonize. Bradbury's Mars is a place of hope, dreams, and metaphor - of crystal pillars and fossil seas—where a fine dust settles on the great empty cities of a silently destroyed civilization. It is here the invaders have come to despoil and commercialize, to grow and to learn - first a trickle, then a torrent, rushing from a world with no future toward a promise of tomorrow. The Earthman conquers Mars...and then is conquered by it, lulled by dangerous lies of comfort and familiarity, and enchanted by the lingering glamour of an ancient, mysterious native race. 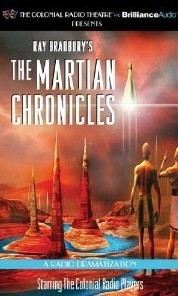 THE MARTIAN CHRONICLES is presented here as a full cast audio production with an original music score and thousands of sound effects by the award winning Colonial Radio Theatre on the Air. It marks their fourth collaboration with one of the most celebrated fiction writers of our time – Ray Bradbury.